Personal weather records have been maintained at the home of Robert Montgomery (position 51°19'54''N,2°35''49''W, elevation 72 metres above sea level) in Bishop Sutton,Bath and North East Somerset,United Kingdom since December 2008. Bishop Sutton is a small village in the Chew Valley lying to the northeast of the Mendip Hills, southwest of Bath and south of Bristol (see map below). The above photo is a view of Bishop Sutton from Burledge Hill. Data was originally recorded by a very basic weather station which produced unreliable temperature readings on sunny summer days. On the 17th of July 2010 the weather station was replaced by a Davis Vantage Pro2 weather station fitted with a daytime fan aspirated radiation shield which records more accurate temperature readings in all weather conditions.See photo below.The temperature/humidity sensor was replaced by an updated version on the 8th of November 2018. The weather station is located on a lawn in a small northwest facing back garden.The radiation shield is positioned 1.2 metres above ground level.Rainfall measurements are recorded by a separate standalone rain collector with its rim at a height of 30cm above ground level (see photo below). The Davis Vantage Pro2 anemometer was originally 3 metres above ground level and was somewhat sheltered from winds with an easterly component. 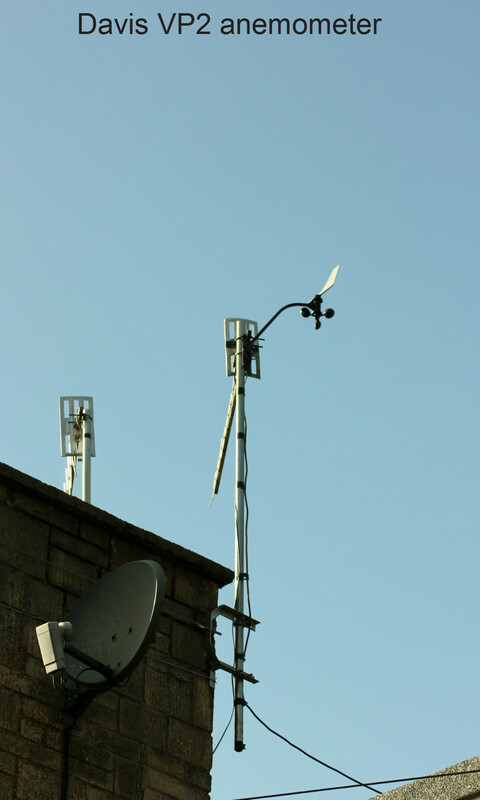 On the 8th of November 2011 the anemometer was fitted to the television aerial mast pole on the roof of my house. It is at an estimated height of at least 8 metres above ground level and is fully exposed to winds from all directions. See photo below. On the 1st of January 2014 the weather station rain gauge was calibrated to equate to the rainfall measurements recorded by a separate stand-alone manual rain gauge. Previous rainfall measurements may may have been under recorded by as much as 20%. Max. snowfall 17 cm 24hr. period to 08:00 2nd of March.